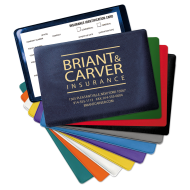 Insurance Card Holders are one of the Mines Press' most popular products. 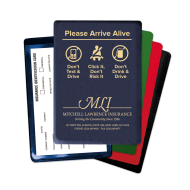 A functional way to remind your insurance clients that you are there when they need you the most. 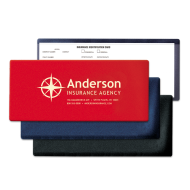 Our registration card holders are available in a wide range of styles and sizes to meet all of your agency's needs. 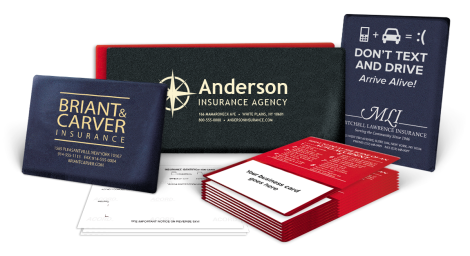 The Mines Press has been providing printing solutions for insurance agencies for over 80 years. 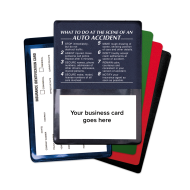 This is why we can tell you with confidence, and based on experience, that Insurance Card Holders are a time-proven and highly effective promotional tool for insurance agencies. Why? Because there are very few promotional products out there that provide this level of functionality for one specific industry. They keep all auto insurance documents and registration cards neatly organized in one place and close-at-hand, and some styles provide crucial information on how to proceed during high-level stress situations, such as being involved in a car accident. 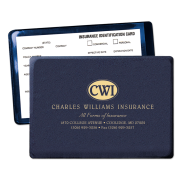 We understand how important it is for insurance agencies to be able to transmit a feeling of security to their clients, and The Mines Press' Registration ID protectors will do just that for you. They deliver a clear message to your clients, with your contact information, accident report guides, safety awareness messages and tips, reminders and more, all in one place and protected by a durable vinyl surface. 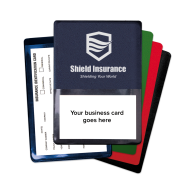 We are confident that this wide array of Insurance Card Holders, along with our personalization options, will allow you to find the perfect solution and fit for your business needs.